Although the majority of operations and procedures in the UK are successful, complications can and do happen. Sometimes they are unavoidable and form part of the risk involved in particular surgical procedures, however infections and nerve damage after an operation or issues may arise as a result of poor surgical after-care can leave you or a loved one with long-term or permanent injuries. If you believe that the hospital or clinic in which your surgery took place didn’t provide you with a reasonable standard of care, or that your surgeon did not sufficiently carry out their duty of care, you might be entitled to make a claim for surgical negligence compensation. If you or your loved one has suffered as a result of surgical negligence and you’d like to discuss your individual case, please call our medical negligence solicitors now on 0800 122 3130 or request a free call back at your soonest convenience. There are times that the medical procedures and care we receive may fall short of everything you expect to receive, and things can go drastically wrong, leaving you worse off and perhaps, severely injured. 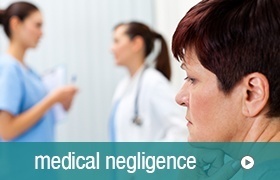 Watch our medical negligence videos for more information about making a medical claim.